In A Hurry? Here's A Quick Summary Of The SKIL Circular Saw Review. This SKIL circular saw is known for its accurate cutting thanks to the laser beam guide. Model 5280-01 has an overall lightweight profile and comes with a 24 Tooth Saw Blade which ensures precision, performance and durability. SKIL also throws in a handy carrying bag with storage compartments. Given the price tag of this SKIL saw, I don’t think you’ll get a better corded power saw from any retailer out there. From an old contender such as SKIL, one expects a fine line of power tools for both commercial and private use. Especially, when the company is owned by none other than Bosch Corp., SKIL comes with an impeccable reputation. With the release of the SKIL 5280-01 15 Amp circular saw, we are looking at a highly affordable mid-range product, which can carve through a variety of materials. However, this model does have a few setbacks. I will get into the nitty gritties later. The perks seem to outweigh some of the disadvantages that come imbued with this model. So, I am going to recommend this SKIL circular saw to anyone who wishes to get by with a plethora of DIY project. Also, if you are an intermediate level wood worker, there’s no reason why this saw won’t help you with any range of projects. TL:DR - SKIL 5280-01 15 is not the best or the ultimate circular saw. For what it’s worth, you are in for a well rounded power tool with the ability of cutting through mildly infuriating range of materials. I say “mildly infuriating” because sometimes circular saws can act a little weird. The last time, I had a $40 circular saw, the blade seemed to have a mind of its own; it’d sway to the side half way through the panel. By the way, model 5280-01 by SKIL is the third product in a row from the same company. I am extremely satisfied with a Bosch corded worm drive circular saw, so SKIL was not an issue for me. I bought it on impulse, while knowing that this is a $60 product, and nothing should be expected in advance. People, who normally complain about skil circular saws are those who either don’t have their expectations aligned with a project, or they are aspiring professionals. And yes, there are fan boys out there too. They like to defame a particular company out of hatred or for whatever reason. Coming back to this particular model, it is mostly in demand due to the inclusion of a guided laser beam vision. Whenever you are in for straight line cuts, the small LED projector in the saw’s overhead will flash a narrow laser line along the entire length of the panel. This way, you can actually see where you blade is headed. For all I know, perfection in making cuts matters a lot. 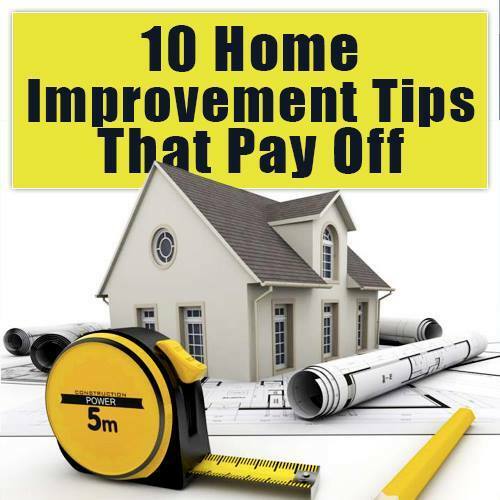 You don’t want a crooked book shelf, or a slightly bent bed post, do you? That’s why straight cuts matter the most. SKIL also answers those who are seeking versatile saws; their mid range circular saws are released for a specific audience. 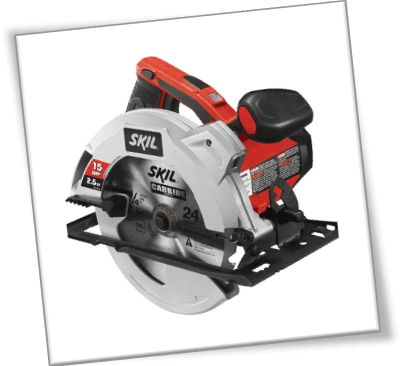 While the company does not make compromises on the product quality factor, I felt that the SKIL 5280-01 15-Amp 7-1/4-Inch Circular Saw had a lot of ground to cover. The masthead says that the product has stainless steel build, but I beg to differ. What kind of steel are they really using? From a distance, this Skil circular saw gives the impression of a flimsy power tool. Maybe SKIL made a few compromises to keep cost expenses at bay, so they decided to cut back on appearances. Speaking of a lack of visual appearance, the SKIL 5280-01 makes up for it by assuring customers with high quality. Trust me, this saw can take a lot of beating. As a matter of fact, mine’s already been through hell – if that’s what you like to call a series of 4 x 12 planks piled on top of each other. I kept cutting through them for an hour or two; the saw didn’t budge or overheat, which is great. Design wise, the SKIL 5280-01 circular saw has a standard look. You get a typical cordless saw design, albeit the cord aspect, alongside a dash of ergonomics. Overall, it is easy to handle because of the rubberized grip. People normally notice the small laser emission head located at the top side of the saw. It gives a ‘latest gadget’ kind of vibe to the product. ​The laser does not need any calibration. By default, the beam goes across several feet of length in advance. It is more than enough for anyone who wants to cut a wood panel in a straight line. I noticed that the laser projection is not very strong during daylight. The beam seemed to maintain a high visual rate in dim light or under normal tube light inside the garage. As far as safety is concerned, Skil’s model: 5280-01 15-v saw plays an entirely different game. There is no electronic brake system. The blade stops via a trigger release mechanism. I get it that electronic brake integration can take the price up by few notches, but cmon’ is it too much to ask for? There’s no price tag for human safety. Period. This one is a surprising intake on the 5280-01 circular saw. Seeing that SKIL maintained the price around $60, dust blowers don’t come cheap. You can carry out your own research in the market. I can bet there aren’t a lot of corded and cordless circular saws that you can come up with. The last time I reviewed Porter Cable PCC660B, Black & Decker BDECS300C and other saws within same price bracket, there was no dust blower installed on those models either. How exactly does it help you? Imagine a scenario where you are cutting a plank without safety headgear. Like it or not, there have been reports of serious damage to eyes where wood workers “forgot” to wear goggles or a protective cover to shield their eyes. A lot of people take this risk, despite of knowing that wood particles can inflict serious injuries. A dust blower will blow away the saw dust particles in the opposite direction from your location. So, if you are cutting a plank from point: A, the dust blower will push out the sawdust in point: B’s direction. 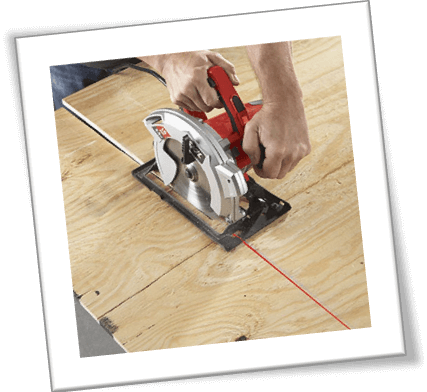 Easily Affordable – Given the price tag, I don’t think you’ll get a better corded power saw from any retailer out there. Limited Warranty – SKIL is offering a limited warranty on all their products. I am not exactly sure on the time period, but I can vouch for Bosch and SKIL for their overall reputation. They react quickly when it comes to product recalls, remittances and other things that matter most to clients. Accurate Cutting: Thanks to the laser beam guided view, you are able to see where the blade’s actually making the cut. It also helps to reduce the hassle of using pencils and Square Tools. 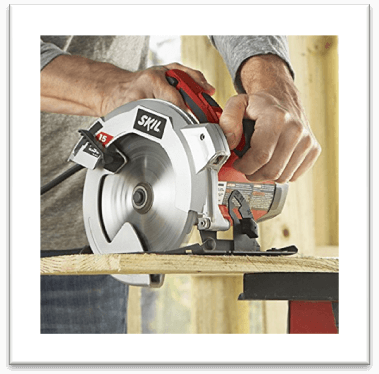 Compact Design: SKIL 5280-01 15-Amp 7-1/4-Inch Circular Saw comes with a compact design – and that too with an overall lightweight profile. Normally, corded models have more weight, which takes a toll on users’ capacity to effortlessly cut through the material in question. 24 Tooth Saw Blade: This model is available with and without the carbide saw blade. Right now, Amazon has listed both versions at a slight price difference of $20 or something. The rest is up to you. While there are cheap circular saw blades available out there, a $20 blade ensures precision, performance and durability. Carrying Bag: While there is no protective case with this Skil circular saw, they have thrown in a carrying bag. Kudos to SKIL for including a flashy bag with each order of the saw. The bag has storage compartments and extra zipped pockets that conveniently help users to carry around their accessories. Lack of Electric Brake: The safety mechanism is based on a trigger release system. It is outdated and can incur serious limb injury by the time the blade stops to a halt. To overcome this issue, always wear hard gloves or extra padded protective gear. Not Very Visually Appealing: The model appears to have a raggedy look, but it makes up for it by offering high durability. Steel Base Plate: I wish the SKIL 5280-01 saw came with a magnesium shoe and base plate, but they added a steel compound. Magnesium, on the other hand, is not only light, but also super tough from long term use perspective. You can exert a lot of weight/ pressure on the saw, without worrying about wearing the shoe out of shape. If we are to do a general price vs. quality assessment of this saw, we are bound to give it a few plus points. SKIL somehow managed to integrate key features that hold core importance when it comes to a power tool’s long term performance. While the SKIL 5280-01 15-Amp 7-1/4-Inch Circular Saw may have a worn out, plastic-y look, the saw excels in crunching out precise speedy cuts. I cannot pinpoint exact stable RPM for this saw because it is not cordless. It does not come with a preset calculated number of revs; the blade performance is different in terms of cutting material. Some people tried to cut a slab of granite, but they failed miserably. I wouldn’t recommend any other stuff apart from plywood, oakwood or normal range slabs. All in all, this one’s a pretty nifty tool. It won’t break or fall apart like conventional circular saws in the market. SKIL is backed up by Bosch powertool company, a beast of a company with its own reputation to look out for. I can’t think of any reason NOT to buy this model. Still not sure which circular saw to buy? You can compare the best circular saws here or read our complete circular saw buying guide right here. Hope this helps you make your decision on which saw you should buy.